Have you ever seen a guide dog in training? These dogs usually wear a special harness or coat and they go through a long training process before they are adopted. Once they know the ropes, they can help people in many ways. 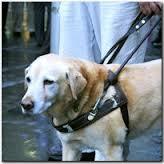 Some guide dogs are trained to help people who are blind. They help their owner get dressed and keep their owner safe in traffic or even at home. Some service dogs help people with physical disabilities but that’s not all about guide and service dogs. Other service dogs help people with physical disabilities. Some service dogs help children who are very sick. These dogs can even help children with learning disabilities or autism. These dogs usually wear a special harness or coat and they go through a long training process before they are adopted. Service dogs spend a year or more in training before they are given to a family. Service dogs must learn to ignore other people and focus on his companion, even when someone else offers him food or calls to him. If you see a service dog, ask before petting him. 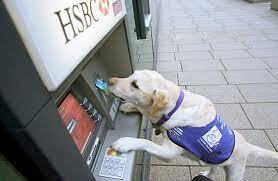 It costs around $20,000 to train a puppy to be a guide dog. Service dogs have to take a test before they can go to work. A news clip about a service dog that surfs as fund raising activities. Question: What kinds of dogs can be service or guide dogs? Answer: Certain breeds, such as Labradors, are known for making good service dogs because they are obedient and easy to train. But, all dogs must pass certain tests before they can be adopted for service. Question: How do people pay for service dogs? Answer: Training a service dog costs a lot of money. People who love service dogs can do fundraising activities to help pay for this training. Maybe you could help raise money for service dogs. Enjoyed the Easy Science for Kids Website all about Guide and Service Dogs info? Take the FREE & fun all about Guide and Service Dogs quiz and download FREE Guide and Service Dogs worksheet for kids. For lengthy info click here. Declan, Tobin. " Guide Dog Facts for Kids ." Easy Science for Kids, Apr 2019. Web. 25 Apr 2019. < https://easyscienceforkids.com/all-about-guide-and-service-dogs/ >.